Hyperion’s Record of the Month for September brings us some astonishingly fresh new compositions from Sir John Tavener. Moving away from the Greek Orthodox rites which have infused so much of his recent output, Tavener’s inspiration now embraces the metaphysical—in both text and musical response—with remarkable results. The Second Coming, for example, sets words by W B Yeats in an outpouring of expectation and drama. 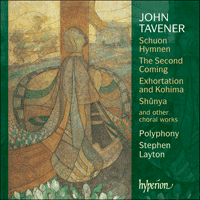 The three newest works—Butterfly Dreams, Schuon Hymnen and Shûnya, all written in 2003—are representative of a new phase in Tavener’s work which has reached its climax thus far in the seven-hour-long Veil of the Temple (to be performed under Stephen Layton at this year’s BBC Proms). Butterfly Dreams may initially appear to be a secular work, yet the composer himself regards it as sacred, butterflies in this context being seen as symbols and even vehicles for the sacred. Schuon Hymnen, setting the words of Sufi sheikh, artist and metaphysician Frithjof Schuon, is a mantra-like Hymn to the Virgin, while Shûnya—written for Stephen Layton—is an extended meditation on the Buddhist ideal of ‘emptiness’ (‘shûnya’); minimal influence from ‘Western’ tonality here visits the world of Tibetan monks, the sonic halo of the temple bowl (a kind of gong) invoking an ecstatic evocation of eternity. As one who has slept, an Easter anthem and the earliest work on this disc, comes from the end of that compositional phase which saw such Tavener favourites as the Song for Athene (performed at Princess Diana’s funeral), and itself deserves to become a part of the core repertory. With no fewer than six première recordings, this disc is essential listening.